With a stay at Sonesta Hotel Guayaquil, you'll be centrally located in Guayaquil, steps from Plaza del Sol and minutes from Mall del Sol Commercial Center. This is an extraordinary retreat in the Galapagos with incredible wildlife encounters guaranteed as you take in the natural beauty of the ocean and mangroves. If Carlsberg made dive locations, this would probably be one of theirs. A place that doesn’t need any introduction and is on every diver's list. See schools of pelagic fish on every dive and indigenous animals on tours of the islands. The diving element of your holiday is likely the pinnacle point. Our liveaboards generally depart from Baltra so any other elements of the trip will be based around this. Once you embark and commence your check dives you will get to see cow rays and Galapagos sharks. Next stop are the world famous sites of Darwin and Wolf. Most divers look forward to their dives here as they encounter schools of pelagic fish on nearly every dive plus regular sightings of sea lions, turtles, penguins, mobula and eagle rays, seals, various species of shark including the ubiquitous hammerhead shark. A phenomenal diving experience is guaranteed in this unique destination! These sites can be so thick with action it can be difficult to recall all the species that have come into view. Sightings of mackerel, manta rays and even dolphins are possible on many dives. If you are lucky, you might have an encounter with a whale shark, especially between the months of August and October. After arriving at San Cristóbal airport, we will visit the San Cristobal Interpretation Center. Here we can learn more about the origin of the archipelago, its fauna and flora, as well as the natural history and first inhabitants. After arriving at San Cristóbal airport, we will visit the San Cristobal Interpretation Center. Here we can learn more about the origin of the archipelago, its fauna and flora, as well as the natural history and first inhabitants. After that, we will hike for about 2 hours to Frigate Hill where you’ll see the endemic vegetation and beautiful views of the island and its surroundings. The Galapagos National Park covers approximately 7,970 square kilometers, which corresponds only to its terrestrial part. This legendary Ecuadorian diving destination is often considered by experienced divers to represent something of a pinnacle in their diving careers. In that sense, many agree that the Galapagos Islands have, quite simply, the best liveaboard diving cruises in the world, plus incredible non-diving wildlife adventure cruises. . The islands are of volcanic origin, unconnected from the continent with deepsea currents making the water rich in nutrients. There is no other island chain like this on the planet. The islands biodiversity is unique both above and below the surface. Our holidays to this location are tailor-made for each client. Our itineraries can take you on an adventure of a lifetime. See the giant tortoises in Puerto Ayora, hike the trail on Tortoga Bay and visit local shops in the area. The trips to Santa Fe offer great wildlife spotting opportunities including Iguanas, mocking birds and crabs to name a few. 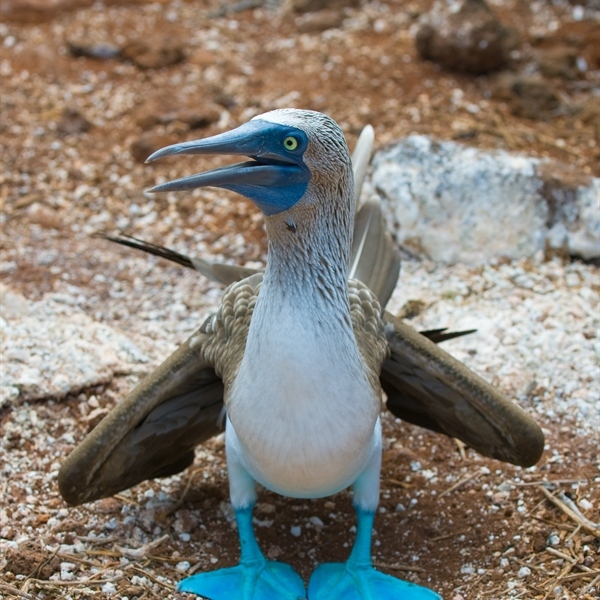 Don’t miss Baltra for the blue footed boobies and ensure to stop by Quito to see the capitals culture. “Wolf Island Caves” - It is easy to exaggerate in the world of scuba diving. One can forget the boring phases of a dive and focus only on the positive. One can make them sound more fascinating on paper than they may have been in reality. Not this dive site. Words seem inadequate. Listing creatures certainly won't do justice to this parade of aquatic wonder. As with all dive sites around Wolf Island there are going to be sharks and turtles; that is a given. There may also be eagle rays and dolphins. Yet this is a site whose backdrop is a series of swim-throughs and a cave which would be fun enough to explore anywhere. When you consider that on exiting each one you could be greeted by hammerheads, white-tip reef sharks or eagle rays, it dawns on you that you are, undeniably, scuba diving in the Galapagos Islands. Where else can you even struggle to pay attention to the briefing when there are dozens of dolphins breaching all around the boat? Bottle-nose dolphins are around Wolf in huge numbers, so you have every chance to see them playing near the surface or even indulging in some carnal shenanigans. “Darwin Island” ¬- The northernmost island of the Galapagos chain is, together with nearby Wolf Island, the focal point of any dive trip to the Galapagos and no serious liveaboard will neglect this area. Surface conditions and current can be tricky here; water temperatures tend to hover around the low-to-mid 20s. There are therefore some warmer water species here. You can expect to see trumpetfish, trevally barracuda. Parrotfish, angelfish, surgeonfish and the delightful racoon butterflyfish are also frequently present, adding a dash of colour to the sites. 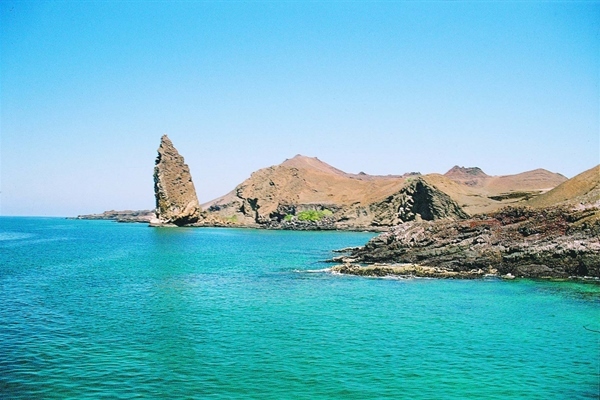 However it is for the breathtaking Galapagos Islands diving that Darwin is famed. Your breath may be taken away by the sight of vast schools of hammerheads or close encounters with individuals plus eagle rays, Galapagos sharks and turtles. These sites can be so thick with action that it is difficult to recall all the species that have come into view but mackerels, manta rays and even dolphins might put in an appearance. If you are lucky you might have an encounter with a whale shark, especially between the months of June and October. It is said that there is only one dive site at Darwin and admittedly the starting point is always the same, in the region where the famous Darwin arch is located. 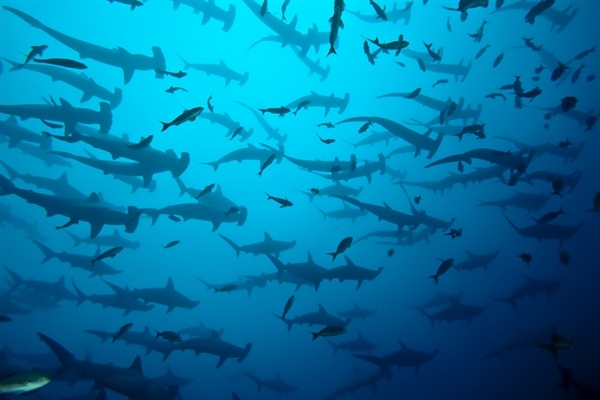 There will likely follow a succession of hammerheads, some distant, some very close weaving their way through the current. This dive gives you a great chance to really look at them in close proximity and marvel at their curious beauty. On quiet times you can look at the little hawkfish and blennies in and around the rocky slope while the occasional Galapagos shark and pelagic fish species may put in a brief show in the blue. But this is really a one creature dive. 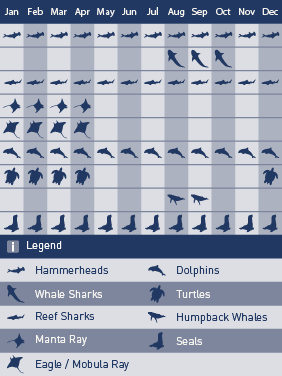 It is all about the hammerhead sharks. You won't be finning around anywhere until it is time to let go and be whisked away through and up the water column to your safety stop. Here, a couple of playful sea lions might flash past your eyes and frolic around the hanging divers. Butterflyfish and angelfish are numerous as are a variety of wrasses, damsels and anthias. Also look out for lobsters lurking in the crevices. 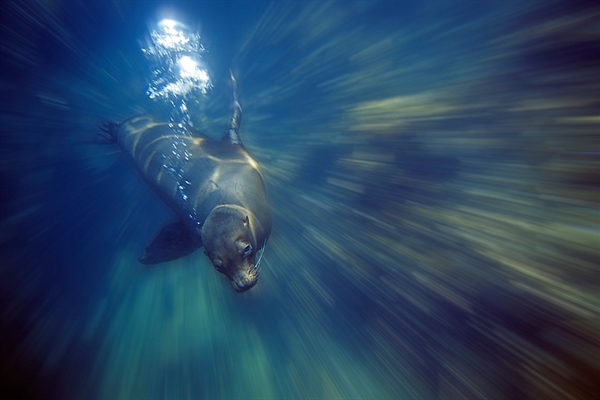 This can feel much more like a warm water dive than any of the other dive sites in the Galapagos Islands. Of course behind these brightly coloured fish flitting to and fro you will see the large ominous shapes of Galapagos sharks and hammerheads. As is a feature of diving in the Galapagos Islands, your safety stop is not an exercise in mundanely watching your 3 minutes tick down. If there are not sea lions to amuse you then there may be dolphins swimming by, close enough to make meaningful eye contact, and make your heart sing. Hundreds of garden eels stretch up from their burrows and starfish are scattered all around the sea-bed. You can expect inquisitive turtles and juvenile moray eels to also be among the marine life investigating the substrate. Sticking close to the sea bed, you will be looking up to see the hammerheads, Galapagos sharks and if you are lucky, the imposing mass of a passing whale shark. Darwin is clearly not an area for beginners. Current, choppy seas, jagged rocks and more may be enough to spook the less experienced diver. Those with good buoyancy, who are comfortable in the water and have done a few dives in differing conditions, will be too distracted by the outrageous marine action to notice anything else. 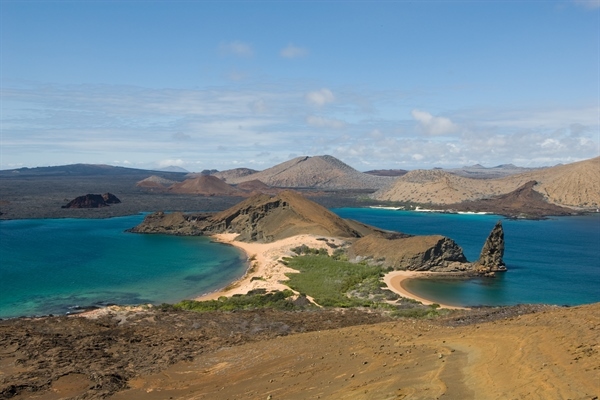 “Vincente Roca” - If any dive site in the Galapagos is going to test whether you brought enough equipment with you to withstand the cold, it is Vincente Roca, located on the north-eastern tip of the island of Isabela. Temperatures can get down into the teens here and an icy blast will greet you as soon as you roll in. The chill will stay with you until you emerge, so wear your hood and everything else you brought with you. In most places this level of cold would mean an unpleasant experience. Not so in Galapagos. As if showcasing the archipelago's diversity, this Galapagos dive site offers up a whole range of creatures vastly different to those you will have seen before. Mola Mola are frequently sited here sometimes several moving their curious forms around with their two main fins above and below their bodies. Dropping down to a sandy floor at around 18 to 22m you will be on the lookout for red-lipped batfish resting on the sea floor. Bringing a light along will really bring out the bright red colour of their eponymous lips. They may scuttle away over the sand with their leg-like fins much to the fascination of anyone watching. Rising up from the sandy floor, you will find along a wall with ridges, grooves and ledges all worth checking out. It also takes your mind off the cold to hunt around for the spider crabs and slipper lobsters and morays that live in the crevices. Cleaner shrimps are about and will crawl over anyone with the courage to expose the flesh of their hand. Also look out for the rare horn shark, aka the Galapagos bullhead shark, on this dive - a small blotchy reef shark. Sea horse and even penguins add to the riotous fun of this chilly playground. Sea lions can be in playful form here, and you may even be treated to their antics of pestering a puffer fish, fully extended for its own protection as the sea lions prod and poke it just for fun. Possible recommended vaccinations are typhoid, hepatitis A, diphtheria, and yellow fever. Do this well ahead of time since some vaccinations, like diphtheria, need to be administered three months prior to your trip! Tipping is not such a big deal here. Ten percent is usual or just round up the tab. British citizens must have a passport valid for six months beyond the date of their arrival in Ecuador. No visa is required for stays of up to 90 days, irrespective of the endorsement with regard to national status contained in the visitor's passport. 14% VAT and 10% Service. 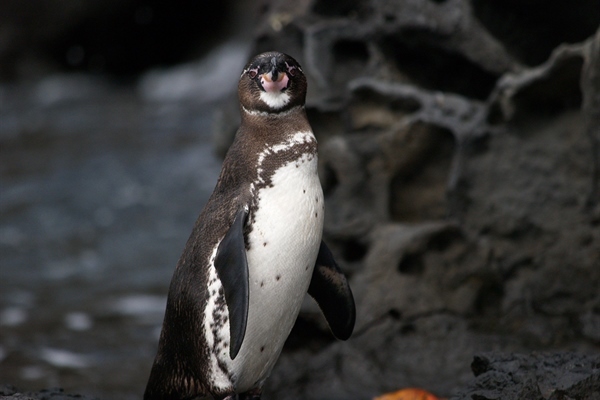 Flights to the Galapagos will be either Quito or Guayaquil. Average flight is 17h & 20min including the stop. Our packages include transfers on arrival and departure day. 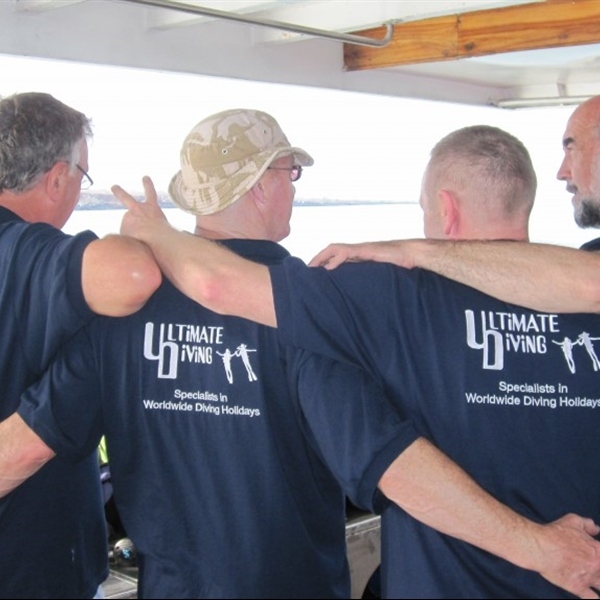 On arrival you will be met by one of our representatives and transferred to the liveaboard. January to June is wet season with sunny spells either side of the brief showers which can occur daily. This period has warmer water temperatures generally fluctuating between 20 - 28°C during this time. Dry season, more or less from July to December, sees less rain but is also cooler above and below the waters. Water temperatures in dry season are usually 16 - 23°C. The wisest course of action is to come prepared with exposure suits for a range of temperatures. Marine conditions are variable and it is better to be over-prepared than under-prepared when scuba diving in Ecuador. 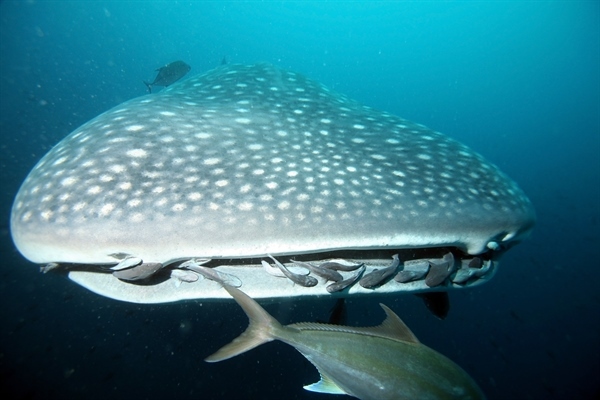 Often whale shark season is emphasised as the best time to come (June to November). 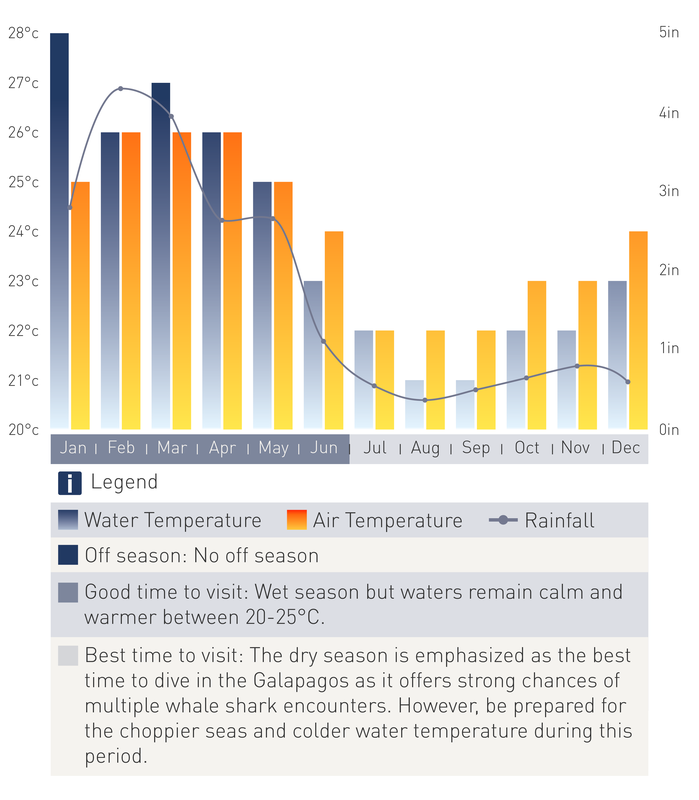 However, many of those in the know contend that January to May, with warm water and sunny skies, offer the most pleasant all round Galapagos diving experience. This period seems to produce better sightings of creatures other than the whale shark, including a greater chance of manta ray encounters and the best hammerhead shark action.